Astronomers have puzzled over why some extremely faint dwarf galaxies spotted in our Milky Way galaxy’s backyard contain so few stars. The galaxies are thought to be some of the tiniest, oldest, and most pristine galaxies in the Universe. 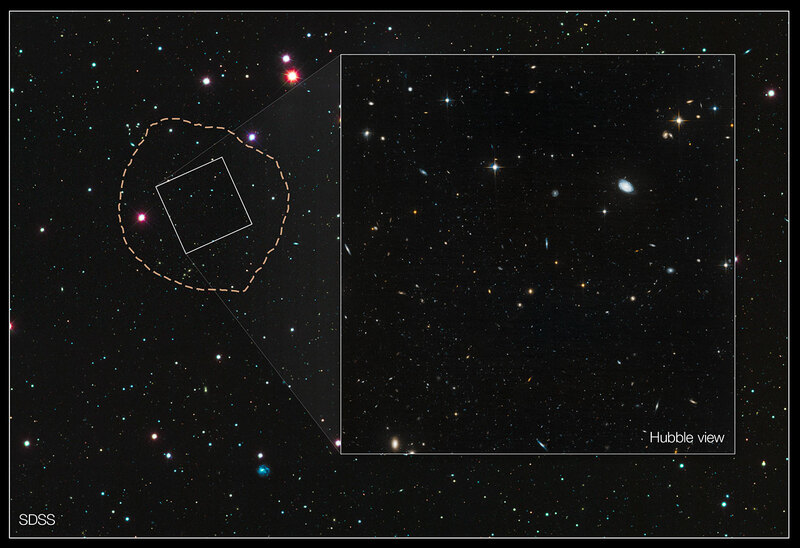 They have been discovered over the past decade by astronomers using automated computer techniques to search through the images of the Sloan Digital Sky Survey. 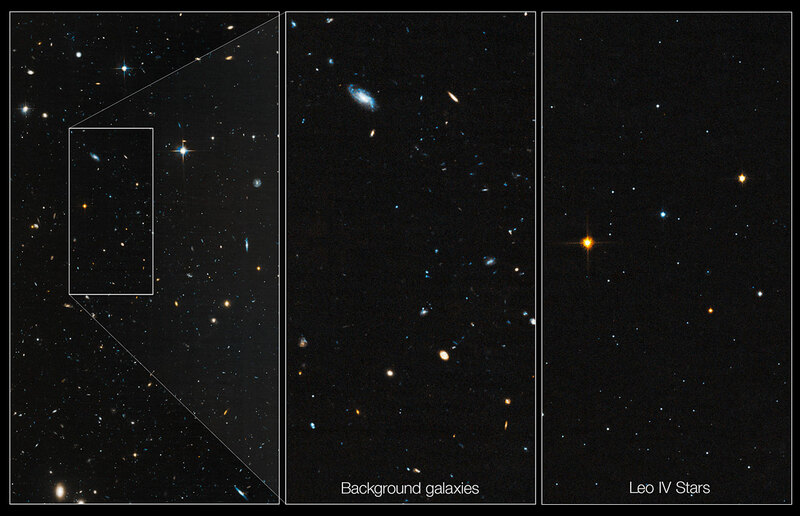 But an international team of astronomers needed the NASA/ESA Hubble Space Telescope to help solve the mystery of why these galaxies are starved of stars, and why so few of them have been found. 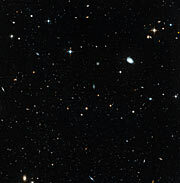 Hubble views of three of these small galaxies, the Hercules, Leo IV and Ursa Major dwarf galaxies, reveal that they all started forming stars more than 13 billion years ago — and then abruptly stopped — all in the first billion years after the Universe was born in the Big Bang. In fact, the extreme age of their stars is similar to Messier 92, the oldest known globular cluster  in the Milky Way. The same radiation that sparked universal reionisation also appears to have squelched star-making activities in dwarf galaxies, such as those in Brown’s study. The small irregular galaxies were born about 100 million years before reionisation began and had just started to churn out stars at that time. Roughly 2000 light-years wide, these galaxies are the lightweight cousins of the more luminous and higher-mass star-making dwarf galaxies near our Milky Way. Unlike their higher-mass relatives, the puny galaxies were not massive enough to shield themselves from the harsh ultraviolet light. What little gas they had was stripped away as the flood of ultraviolet light rushed through them. Their gas supply depleted, the galaxies could not make new stars. The discovery could help explain the so-called “missing satellite problem,” where only a few dozen dwarf galaxies have been observed around the Milky Way while the computer simulations predict that thousands should exist. One possible explanation for the low number discovered to date is that there has been very little, or even no star formation in the smallest of these dwarf galaxies, leaving them virtually invisible. 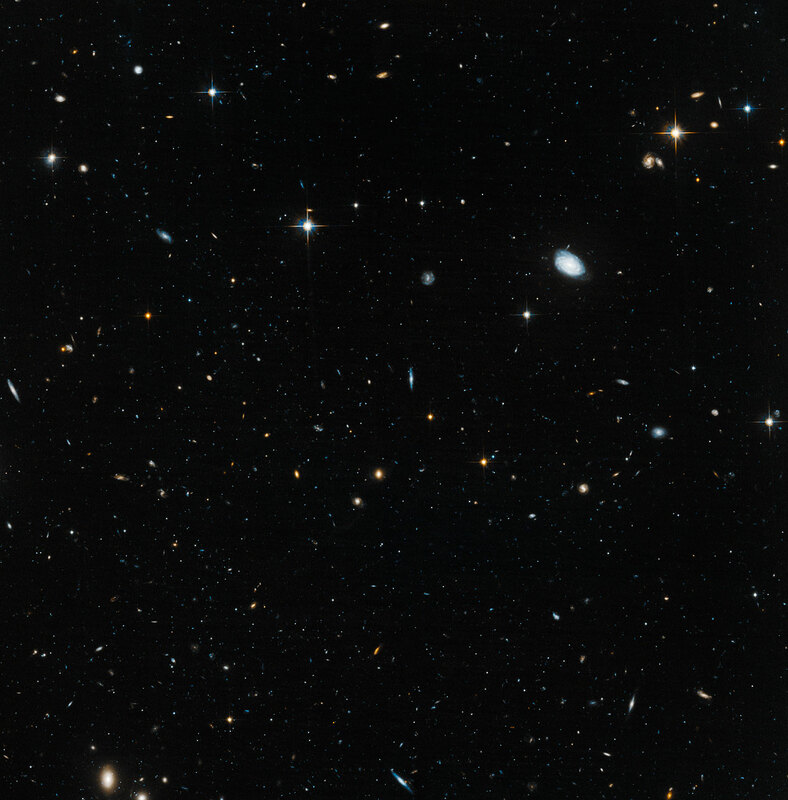 The Sloan survey recently uncovered more than a dozen of these galaxies in our cosmic neighbourhood. These have very few stars — only a few hundred or thousand — but a great deal of dark matter, the underlying scaffolding upon which galaxies are built. 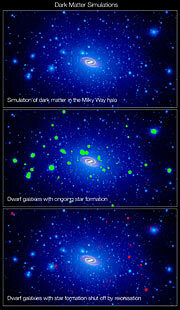 Normal dwarf galaxies near the Milky Way contain 10 times more dark matter than the ordinary matter that makes up gas and stars, while in these so-called ultra-faint dwarf galaxies, dark matter outweighs ordinary matter by at least a factor of 100. 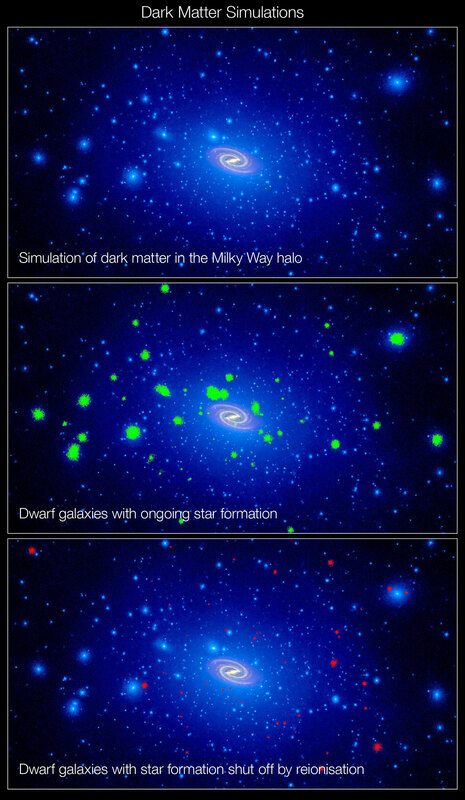 Astronomers think the rest of the sky should contain dozens more of these ultra-faint dwarf galaxies with few stars, and the evidence for squelched star formation in the smallest of these dwarfs suggests that there may be still thousands more with essentially no stars at all. The results are published in the 1 July issue of The Astrophysical Journal Letters. Globular clusters are tightly-bound spherical collections of up to a few hundred thousand stars. They are known to contain some of the most ancient stars in the Universe. In addition, globular clusters are known to have formed in single events, so all the stars in them have the same age. The period of reionisation is also the limit for how far telescopes can see: the process is what rendered the Universe’s hydrogen gas transparent to ultraviolet light.